Avalanche is an infinite video loop that encapsulates the sublime magnitude, awe and beauty of a single white wall of ice and snow enveloping everything in its path. The accompanying sound track composed of filtered white noise, low frequency sine wave pulses and extended harmonic tones is synchronized to each loop. The work itself is an exploration of viewer/listener experience where the immersive repetition of imagery and sound seeks to abstract and re-contextualize the naturally occurring phenomena. Stride perpetuates a fragment of time by stretching, repeating and therefore suspending a minute moment. 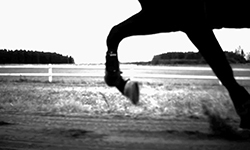 High-speed video technology encapsulates in slow motion and detail unknown to the human eye moments such as a single stride of a galloping racehorse and the pendulum motion of a light fixture. Visual subtleties, nuances and movement are amplified at 300 frames per second. Force Fields is a twenty-minute video and sound composition using custom developed video manipulation hardware. The unique device developed in 2008 called the AV5-Error enables sound to be forced into an active video signal. Sound then becomes visible through this process. The structure of Force Fields consists of eleven short compositions recorded live in a studio context. Each composition consists of short arrangements of a various pure tone frequencies, metronomic pulse wave clicks, white noise and microphonefeedback being forced into monochromes of broadcast test tone colour bands. practicing experimental musician who regularly produces and performs as a solo artist and collaboratively as an active member of the minimal electronic improvisation sextet, Plains and one half of the electronic noise duo 1000. Watkins has numerous releases of recorded material on a variety of local and international record labels such as Circle, 20 City, Claudia, Mystery Sea, CMR, Absurd and Scarcelight. He has a Doctorate in Fine Arts, and lectures experimental time-based media at Auckland University of Technology, New Zealand.